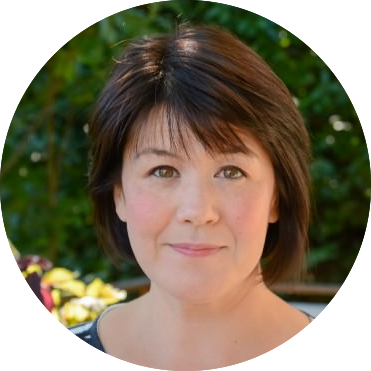 Adding variety to your diet when you are on an elimination protocol can be difficult. I have been trying to focus on filling our meals with foods known for their healing properties and turmeric has become one of our favorite new spices. It is used in ayurvedic medicine to help clear infections, fight inflammation and aid in digestion. We’ve been drinking it in tea and tonics and I’ve been tossing it with some of my favorite vegetables before roasting. The main active ingredient in tumeric is curcumin but in order for your body to absorb it properly, it’s beneficial to combine it with black pepper and some type of fat. This soup takes care of that thanks to the baharat spice blend that I roasted the squash in and lots of coconut milk. 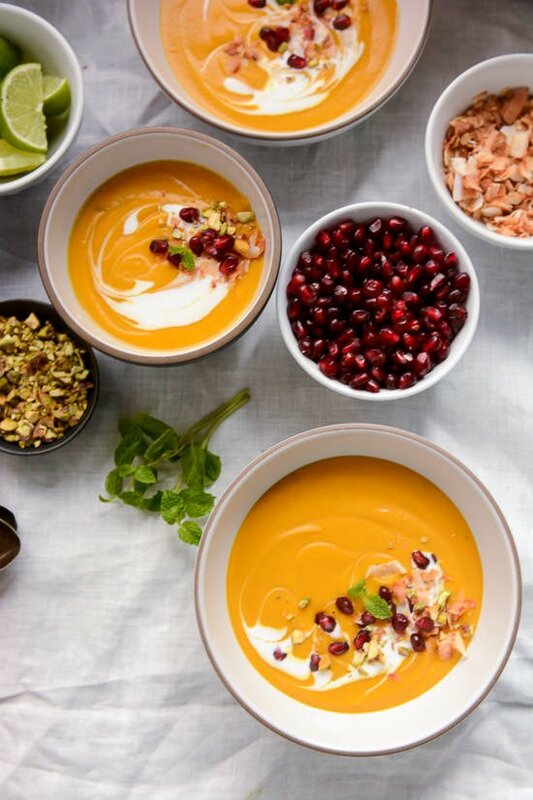 The idea for the soup from my favorite chef, Yotam Ottolenghi . His cookbook, Plenty has had a huge influence on my cooking and it’s a constant source of inspiration. The recipe for baharat is from him but just like most regional spice blends there are tons of variations based on individual tastes and availability. If you don’t like any of the spices listed feel free to omit, you will have more than you need for the soup but it will keep for a few months and is great on grilled vegetables, mixed into hummus or as a marinade for meat. This is basically health in a bowl, or at least that’s what I told myself as I helped myself to a second serving. 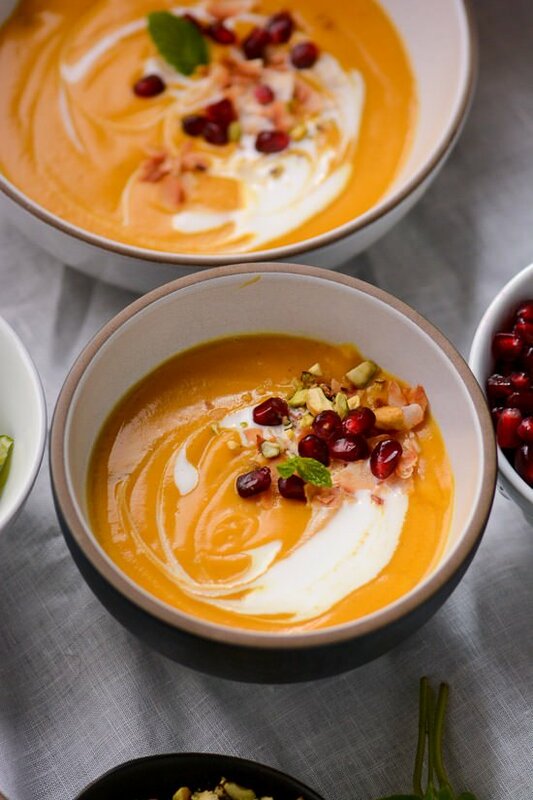 The soup is delicious as it is but I like to top it with some chopped pistachios, mint, toasted coconut and pomegranate seeds. I like to have a bit of crunch and texture in my soup but feel free to just use one or two of the toppings or none at all. The soup freezes really well so pack leftovers into single serving containers and you can have lunch ready in a flash! 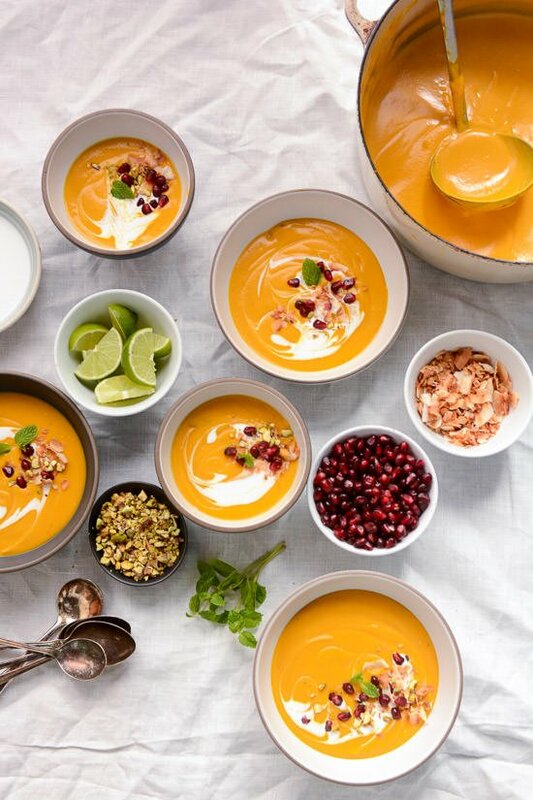 This vegan butternut squash and coconut soup is mostly hands off in the oven. 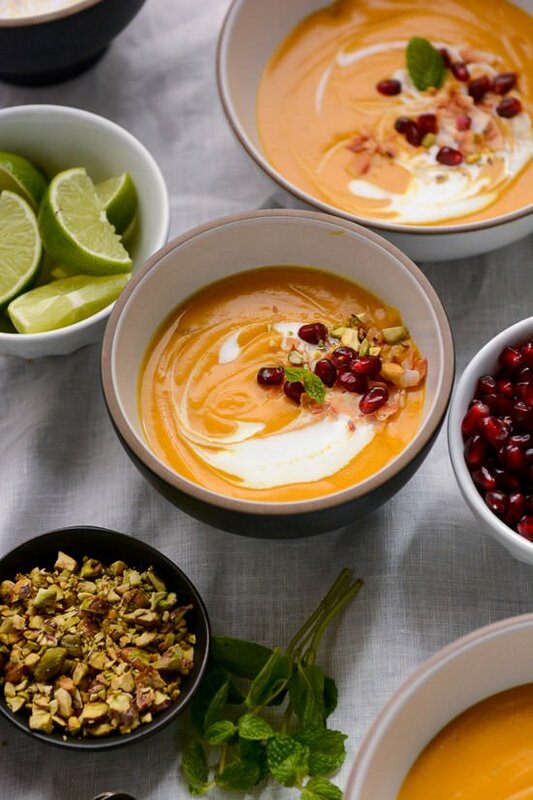 The soup is spiced with baharat, a Middle Eastern spice blend that gives a warm aromatic flavor to the soup that is unresistable! Line a large baking sheet with parchment paper. 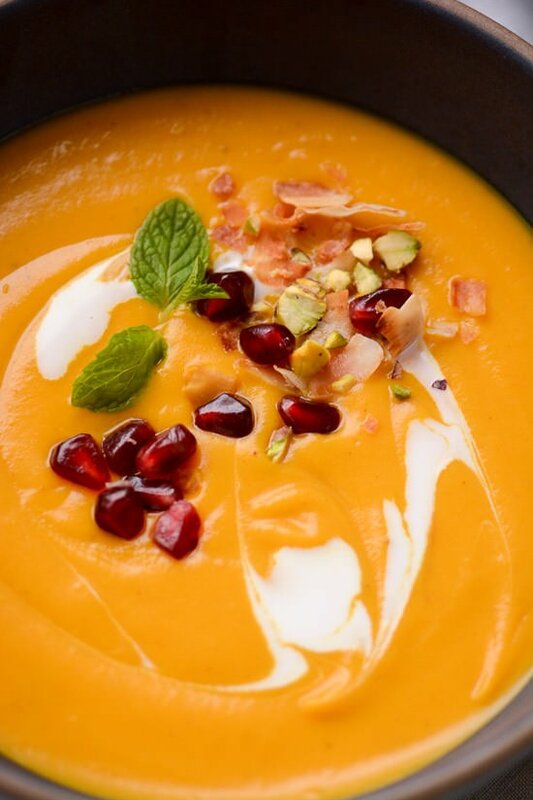 Place the butternut squash and shallot and toss with the olive oil, ginger, baharat, turmeric and salt until well combined. Roast the squash for 35 - 40 minutes or until tender. 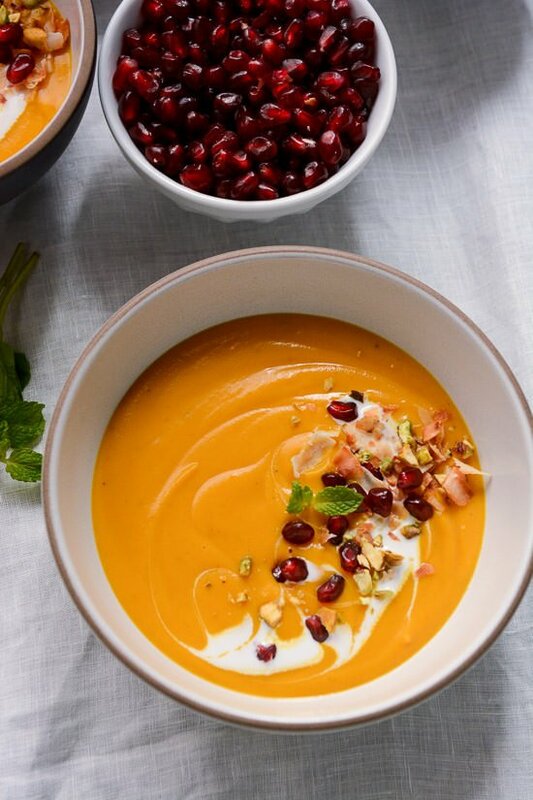 Place the cooked squash into a high speed blender and add the cup of coconut milk, apple cider vinegar and 2 cups of water. Don't overfill your blender, you will most likely need to divide the soup into two batches. 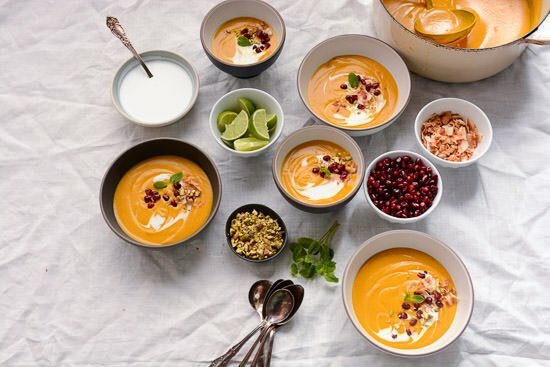 If you have a Vitamix you can use the soup function to heat the soup through, otherwise transfer the soup to a large pot and cook on low until heated through, taste and adjust adding more salt or vinegar if desired. 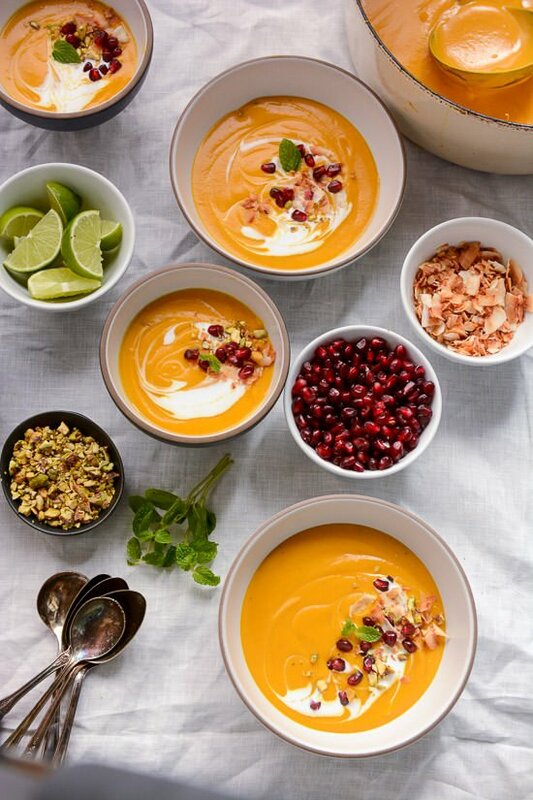 To serve, ladle some soup into a bowl, top with a swirl of coconut milk and then top with pomegranate seeds, toasted coconut, pistachios and chopped mint. Serve with lime slices on the side. Place all the spices in a spice grinder or mortar and grind until a fine powder is formed. Store in an airtight container, where it will keep for 8 weeks.